When browsing through the Switch’s eShop I spied Riot and was instantly curious. The backstory behind the game’s development had me even more intrigued when I discovered that the developers behind Riot found themselves caught in, well, a riot! This is what inspired them to create a game about actual conflicts, showing them in a neutral light, and allowing the player to choose between the protesters or the police. An interesting and important concept presented through a beautiful looking style that was fully funded through Kickstarter, but is it enough to inspire people to join the cause? Right away I fell in love with the art, obviously inspired by Sword and Sworcery. 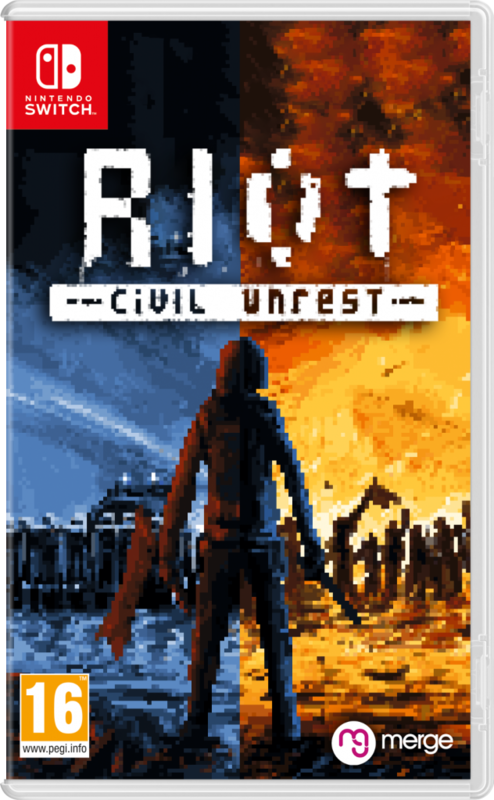 It’s got a 2D, pixel art style that mixed well with the chaotic sounds of crowds and conflict to create a gritty, somewhat dark atmosphere. Unfortunately, that’s about where the good ends in this review. The music wasn’t impressive, but thankfully there wasn’t much of it. I tried to move about the menus, but the controls were incredibly wonky. When I finally did manage to drop onto the dark and dangerous streets of Italy, I immediately realized that I had no idea what I was doing. After several extremely frustratingly failed missions, through tedious trial and error, I finally, vaguely grasped how to control the several groups the game puts you in control of. Whether you choose Protestors or Police, you will manage a few groups of your faction you must position and control all at once. They think and act on their own, creating a believable look and feel of a real conflict. It’s fun to watch, but to play? Well, it’s about as effective as trying to juggle geese as they desperately try to fly away. Frustrating controls will have you trying to switch between groups on the fly, struggling to move them into position, all while using abilities all at the same time. If the AI of the mobs were up to par, this might feel as well as it looks, but it’s an absolute wreck. Hold a button to activate “hostile” mode, but oh wait, a group became bored and buggered off. Now I have to switch over to that group, move them back, switch back over, try it all over again, and hope to god the kids behave as their told. It’s a cumbersome system, and the lack of direction or payoff made it difficult to want to keep going back for more punishment. Another significant deterrent from asking for another helping of Riot was the total lack of variety in missions. The map will change somewhat, but the objectives are always the same: Hold the line at point A or push the line back to point B.
Riot’s pointless upgrade system has zero effect on your units, and more than likely you will skip it altogether. On top of it all, it’s difficult to measure the effectiveness of the different “abilities” you have at your disposal. In the end, each playthrough felt and looked the same as the last. An interesting take on significant events that I agree we should all be informed of, but Riot’s horrible execution leaves a lot to be desired. When you get the hang of the controls, it begins to resemble something along the lines of fun, but by then I was ready to move onto something else. I give Riot: Civil Unrest 5 smoke grenades out of 10. Maybe just watch this one on the news. Rating: 5.0 out of 10. Previous WonderCon 2019- Day One Brings It!